so, here is a nice photo of my next few projects. You see the potential, no? Yarn is *sighs* Plucky Feet, Ballpoint, Dandy Lion, Oatmeal–those Addi Turbos are going to make it into a Color Affection. Fabric in the basket is for a Roly Poly Pinafore for Lucy. Background fabric is Liberty Stile Mackintosh. Lucy and I get to duke it out over this cut–we’ll see who wins. She’s awfully scrappy. This coming week I have to share: a finished x-plus quilt (I hope I hope); an improv-pieced top that POSSESSED me on Thursday; a collaborative quilt I was so lucky to get to work on; and Lucy’s Tiny Tea Leaves Cardi, all finished and modeled by the cutest curly-headed Jeopardy-watching toddler ever. come back for lots of finishes and eye candy this week, pinky swear! OMG I want that yarn. Gorgeous. Mmm, those yarn colors look great together! I just got them same liberty print . . . Wish I could say the same about the plucky. 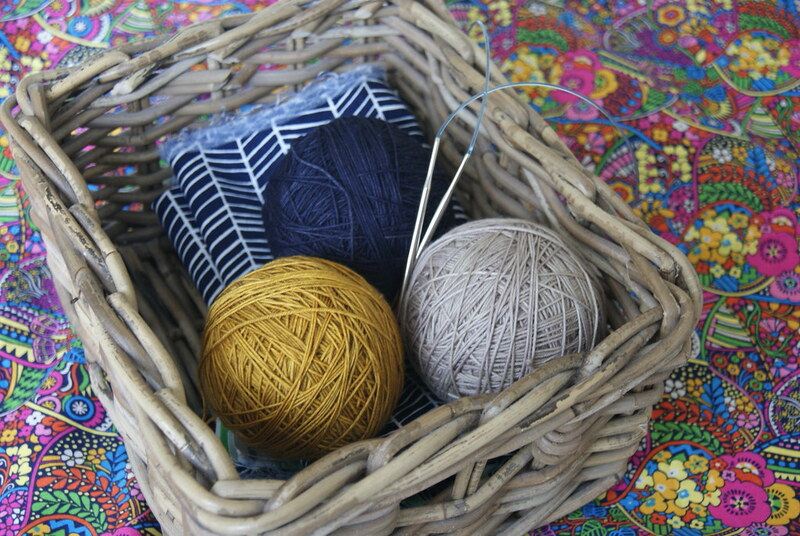 Love the colour combo of the yarns – hmmm, would look good in a quilt!! Oh lots of pretty things! I love the yarn and the fabric. I just checked out the pattern fro Color Affection. It is going to look fab in the colors you have chosen. oh, goodness! i love those blocks. so hope you get it completed soon.